May | 2009 | okay, peanut. We’re home and alive – yay! Not that you needed to see pictures of my hot legs (Ha! ), but here’s what we’re talking about pre- and post-scratch … eek. I called my doctor’s office at 10:00 and got an appointment at 10:45, so we had to fly out of here to make it there in time. I’m having some sort of allergic reaction to something, it’s what that we don’t know. Based on the locations of my gorgeous splotches and their movement, it’s possibly related to something used in the hospital during delivery, possibly not. Anyway, I am to drug myself up on Benadryl (Sigh … I hate the stuff.) and have some high-powered cortizone cream to use. Hurray. As for Lily, we heard from Dr. Bruce, and according to him, “I wouldn’t be concerned.” Translation – stop being a paranoid first-time mom, she’s fine. Dr. Bruce, you rock! He’s very laid-back and doesn’t make you come in for every little thing; I dig it. So we’re here and alive. I’m still wanting to claw at my skin, but am fighting the urge, for now. We’ll see how long that lasts. Guess I better hit the Benadryl soon if I really want to avoid more scratches (Ooh, too late.). This ought to be cute – me, strung out on Benadryl taking care of a 2 1/2 week old Lily. I can hardly wait to find out what the next few days will bring! Not exactly how I thought I would begin my blogging adventure post-birth, but hey, you have to start somewhere, right? I know, I have a lot of catching up to do. Believe me, I’ll try fitting that in somewhere between feedings every 2-3 hours and the housework that needs to get done. This is impossible! Anyway, we’re up and ready for one heck of a day. Lily has had some congestion for a few days now, and while it’s improved, it’s not gone. It’s keeping her from sleeping in her crib (and me from sleeping napping in my bed at night), so I’m calling her pediatrician this morning to see what he thinks. On the other hand, I’m in a much worse state. 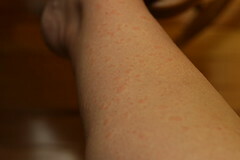 I have something horrible going on with my skin; started out as the tops of my feet itching, but it’s now huge red bumps that are covering the tops of my feet, my legs, stomach, and now working their way around my arms. Yep, time for me to get some intervention, too. 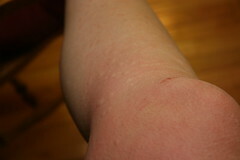 I almost lost it last night; the itching is uncontrollable and in certain places, I’ve scratched right through my skin. Nice. We’re hanging in there. We’re making do. And I can honestly say I’ve never been so tired. I long to walk upstairs with my husband at 11 pm and come back downstairs after a full 7 hours of rest. I’m so jealous I could spit. I love parenthood … really, I do. It’s just so exhausting. Now, off to shower before it’s time for Peanut to eat again. Woohoo. I’ll keep you posted on our health status once I know anything. As I stated elsewhere, I’m handing out doctor’s appointments today like Halloween candy … argh. It’s going to be a beautiful day! The countdown is on, and as of today, we’re at 9-ish days! I’m ready. I’m not done and am not ready to say I’ve had enough, but I’m ready. I want to meet this new person and start our new life with her. Yeah, I know life will change drastically; if I had a quarter, or even a nickel, for every time I heard that, I’d be a millionaire by now (Oh, how I’d love to not have to come back to work!)! Is it so bizarre that both hubs and I are ready for that change? Perhaps it’s just this whole pregnancy thing that’s made me more critical, I don’t know. I’ll tell ya one thing I can’t stand – people looking at me like I’m ill. Their heads turn to the side and they get a concerned look on their faces as they ask in their most serious voice, “How are you feeling today? Are you okay?” People, do I look sickly? Do I appear as though I’m in pain? Have I complained? No! In all seriousness, I’m completely fine. Yes, I have occasional aches and pains associated with carrying a bowling ball in my gut and my feet, ankles and calves could be painted green and mistaken for Princess Fiona’s super-fly stems, but it’s nothing earth shattering. I really am great 90% of the time! It makes me want to scream. Ooh, so sorry for the rant – sheesh. While I took a brief hiatus from working on little miss’ quilt (I just couldn’t bear the fight with the sewing machine that’s got a mind of its own – we needed a break. Crazy thing is still not working properly, but I’m dealing. I’ve become one with my seam ripper; we’re best buds thanks to the machine’s random fabric and thread snacking tendencies. ), I’m pleased to say I’m back at it and almost done! The last bit of sewing should be wrapped up tonight, and at that point I can begin the tedious job of cutting to create the “rag” in the rag quilt. I’m so psyched, and pleased with how it looks so far. I’ll update with pictures soon. Me: I think she’ll be late – my guess is Monday, 5/18. Other friends: Others have pointed out things, as well … like the fact that there’s a full moon on Saturday! And another friend with that creepy intuition also has a “feeling” about this weekend. The number game: The 7th is little miss’ aunt Michelle’s birthday, and she said she’d be happy to share! The 9th is a full moon. The 10th is a day of the month shared by many – aunt April was born on 11/10, and cousins Kannon & Magnum were born on 9/10 & 7/10. The 15th marks the one month anniversary of the loss of Grandma Rosie (Little miss will have Rose as her middle name – xoxoxo.). The 23rd is the day my grandmother was born. And I have many friends with May birthdays, as well! I know I’m forgetting things, but you get the point. Is that enough updating for now? ;0) At this point, I’m rollin’ along with my first week of stats (1 cm, 60%, -3, anterior) and hoping to either have a person before Tuesday afternoon’s appointment or have better progress to report! Today is 38w5d – so no matter what, we’re getting fabulously close!!! In advance, I’m sorry. I know this has nothing to do with anything, but I’ve got to share! Perhaps it’s pregnancy that’s made me more sensitive to these issues – I don’t know. In the grand scheme of things, they don’t matter, but for the past few months, these issues have been driving me c-r-a-z-y! I work in an office setting with 30 or so co-workers, 11 of them women (This will become relevant.). While as a whole I can say we’re a fairly neat bunch, there are a few exceptions to the rule. I’ve successfully targeted one of our messy members, and can’t pinpoint whether or not this person is the only messy one of the bunch. Regardless, some of these things are completely ridiculous. When you use a community utensil, say, a shared knife, do you wash it and put it away or leave it in the sink for the next person to clean, use, and then clean for themselves? If you peel your hard boiled eggs in the kitchen sink, do you leave the shells in the sink, or do you remove them? When you use the last of the roll of toilet paper, do you leave it for the next person to replace, or do you take the initiative to replace it? I could go on with more office specific examples (think copier, shredder, jamming, replacing paper, etc. ), but I’ll spare you the pain and boring details. I don’t understand how people can be so disgusting. Seriously, do these people do this stuff at home? I know for a fact that the person I’ve pinpointed doesn’t have a maid or cleaning service. Perhaps said person’s spouse cleans up after them – oh, the life!